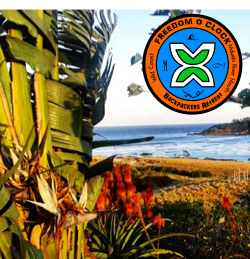 Located at the mouth of the Bomvu River, this beach is perfect for solidarity. 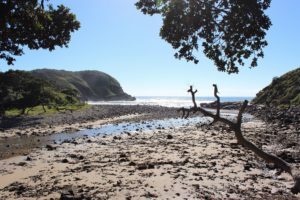 Bomvu Beach is rocky but known for many activities that make Coffee Bay so great. Just around the corner from most accommodations, its a great beach to spend the day or evening. The rocky bank leads up to grass that is settled nicely under the trees. This specific shade spot is the preferred location for local drummers to play during the daylight hours. The Bomvu Rhythm drummers can be heard throughout Coffee Bay at night and light up the Wild Coast through their sounds. It’s a privilege to have them at our doorstep, so go check them out if you get the chance. The drummers aren’t the only Coffee Bay locals you’ll spot out at Bomvu. 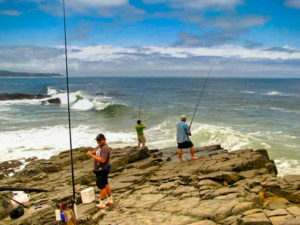 The rock formations off this beach make it a great spot for fishing, but can be quite tricky. It’s recommended to fish with a local off these rocks for the best results. Bomvu beach can be described as a beach for the pro’s. Not only is the fishing off this beach hard, the surfing is for the daring. Some days the break off Coffee Bay beach isn’t cutting it, but walk around the corner and Bomvu can have it’s own thing happening. It’s one of the beauties of surfing Coffee Bay. The Bomvu River is the crossing point to get to the other side of Coffee Bay. Sometimes the river will be very low which makes crossing it very easy, with a hop and a skip. When it is more full, be careful, take off your shoes or you’ll end up soaked! At the eastern end of the beach is the start of the Sugarloaf Hill path. You can take this path to the top of the hill for the spectacular views, or to put you out on the main Coffee Bay beach. But if looking for a more quiet setting, Bomvu beach is it. It’s ducked off in its own nook, which makes a great place to relax away from the main beaches. Consider it a hideout, in a hideaway place.